The OSU Buckeyes have a delegation of loyal fans who take their football very seriously. 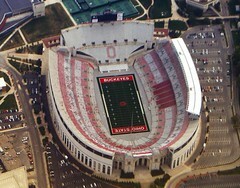 This Saturday, April 25, the Buckeyes will make their fans very happy by providing them with a Spring football game. The Spring game will give fans a chance to get their football fix in, if ever so briefly, filling them with a taste of how they will perform come Fall. The game will take place at Ohio Stadium in Columbus Ohio this Saturday, at 1:30 p.m. There will also be television coverage on WBNS 10TV, ONN and radio coverage on WBNS-AM/FM (1460/97.1). If you are a OSU sports fanatic you can catch the Men’s Lacrosse game (playing Notre Dame) in the stadium at 11 a.m., before the football game. You don’t have to wait until Fall for football in Columbus Ohio. Tickets are $5 and cover both games. Tickets can be purchased ahead of time at the Ohio State ticket office at the Schottenstein Center and at local McDonald’s restaurants.